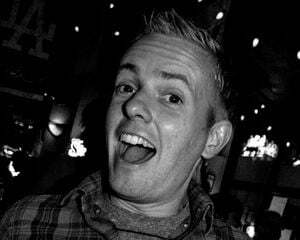 The Memory Card .10: To the moon, Mario! Since E3 has ended, I have to say, I am on a Super Mario Galaxy high (and not looking forward to the imminent withdrawal). In a word, the game is amazing. Now that The Memory Card has finally returned from a two-week hiatus, I figured there was no other choice then to focus on all things Mario. Heck, I couldn’t even get the subject off my mind if I tried. It’s kind of like that old Tootsie Roll commercial where everything the kid sees is a piece of candy. Yeah, it’s like that, but with Goombas. Lucky for me, the Mario series has spawned some of the most memorable and classic moments in videogame history. And to my surprise, one of my favorite moments in particular is even eerily reminiscent of some of the innovative, planet-revolving gameplay experienced in Galaxy. 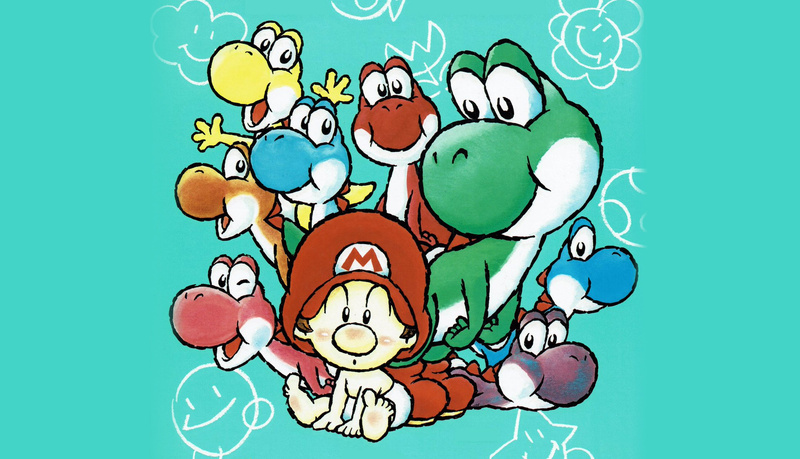 Super Mario World 2: Yoshi’s Island is a classic, to say the least. The level design is pretty much perfect, the control is spot-on, the art style is beautiful, and the graphics, at the time, were technologically superior to anything else out there. With all these things going for it, it comes as no surprise that a large amount of critics and gamers (myself included) call it the greatest 2D platformer of all time. As far as story and structure goes, nothing is really out of the ordinary. 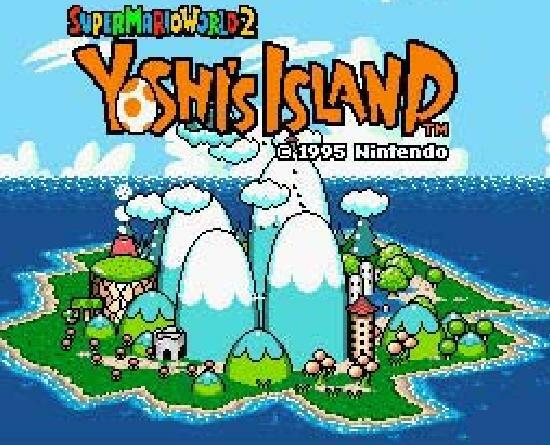 In Yoshi’s Island, you actually play as Yoshi (a series first), carrying Baby Mario across a vast island in search of his kidnapped brother, Baby Luigi. 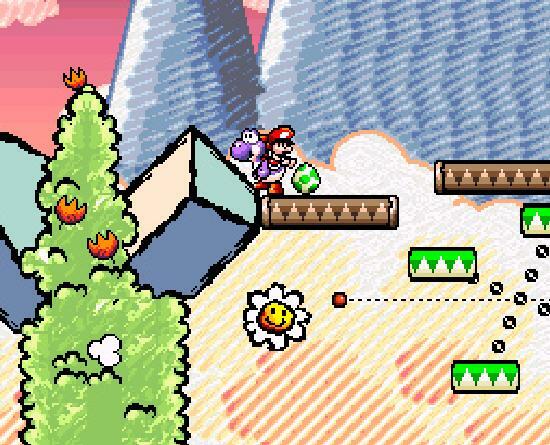 Granted, the characters and mission may be different, but that classic Mario level set-up remains, thankfully, the same. The island you travel across is separated into multiple worlds (forest, lava, snow, etc.). 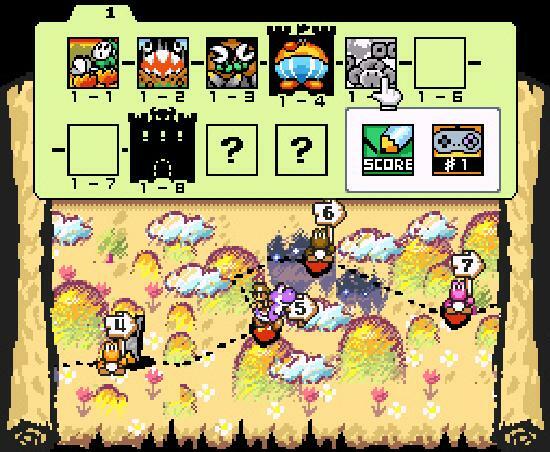 Each world is separated into eight sub-levels that you must complete one at a time in order to reach the final boss of each stage. Like I said, nothing out of the ordinary. 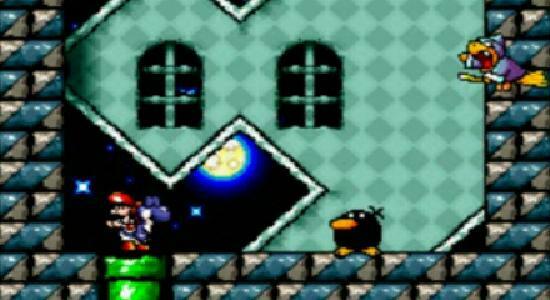 What sets Yoshi’s Island apart, though, is the way each of these levels is presented. The game uses the Super FX2 microchip, which allows for some of the coolest scaling and polygonal effects you will ever see on something as lacking in power (when compared to modern consoles) as the Super Nintendo. Even today, the graphics are very impressive and still hold up after all of these years. As you play through the game, you experience a wide variety of levels and bosses, each one more creative than the next. There were two bosses that I always remembered as being ridiculously awesome and, honestly, had trouble deciding which one was my favorite. Upon going to E3 and playing Super Mario Galaxy, though, I settled on the one that not only reminded me of said game, but may have a bigger impact on my overall memory and, in my opinion, is the epitome of the kind of remarkable creativity that games made by Nintendo provide. At the end of World 5 (a cloud-themed world) you reach the castle of Raphael the Raven. Like all the end-of-world castles in the game, many different types of obstacles and challenges await you, most forcing you to use skills you learned in the previous world. Like all of the other bosses in Yoshi’s Island, Raphael starts as an unassuming, almost tiny monster that you normally could destroy with just one quick stomp. Kamek (Bowser’s right-hand magician), however, always flies in at the worst moment and sprinkles these weak monsters with some magic dust, causing them to grow in size, some enemies expanding large enough to fill the entire screen. In the case of Raphael, though, the magic dust only makes him a little bigger, hardly enough to pose a serious threat. Right before you even have time to think about the laughably easy way you will defeat this boss, Raphael charges forward and knocks Yoshi and Baby Mario into the sky. To make matters worse, when you fly in the air all your eggs (your only weapon) are knocked away as well, leaving you completely defenseless. After breaking through the roof of the castle, the egg-less Yoshi eventually lands on the surface of a very small moon (which, if you were paying attention, you could actually see from the scene in the castle seconds earlier). Immediately, Raphael leaps from his throne room and lands on the other side of the same tiny satellite. With no eggs to attack with, it is up to the player to figure out what to do next. Unfortunately, jumping on top of Raphael’s head does not work, so another means of attack must be figured out. As you watch Raphael more, you realize that he likes to quickly circle the moon before he charges in for an attack. And, not coincidentally, there are two stakes jettisoning out of the surface that he sometimes stops opposite of. By using your ground pound (a staple move in the Mario games), you can actually smack the stakes and force them to push out the other side. Using some pretty tricky timing, you can avoid Raphael’s attack and then quickly ground pound the stakes when he is completely opposite of your position, resulting in a clean, rewarding hit on the menacing boss. Do this move three times and the boss if defeated, turning him into just another constellation in the starry night sky. I love Super Mario World 2: Yoshi’s Island for so many different reasons, but the creativity of the bosses is one of the highlights. Seriously, each boss is completely different and offers a new experience with each one you meet. I don’t know what it is specifically about Raphael the Raven that tickles my fancy, so to speak, but, in my mind, every aspect of a well-made game comes together, making the sequence all the more memorable. First off, having the entire battle set on a small moon is incredibly creative. All of the bosses up to this point (heck, most bosses in general) are fought in a big room as you move left and right on the screen. Not to say there is anything wrong with being traditional, but there is a lack of surprise once gamers become accustomed to a certain way of doing things. Fighting Raphael the Raven on such a small space really adds to the challenge and is such an interesting twist on “normal” boss battles. And while the graphics are beautiful (the whole game is filled with one jaw-dropping sprite after the next), take a gander at the video again and notice how perfectly they are actually implemented. 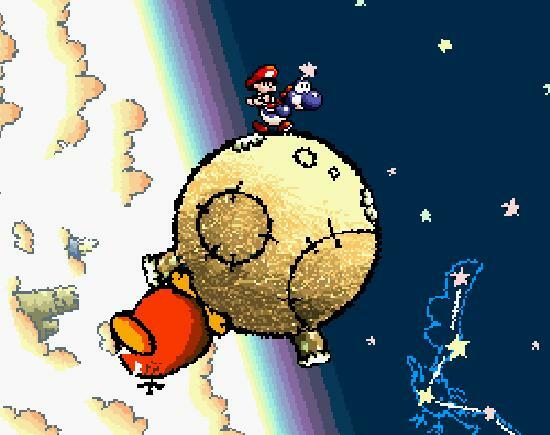 Instead of Yoshi and Baby Mario running around the moon, the entire background rotates around them, keeping your character, technically, in the same spot on-screen the entire time. Not only does this show off the game’s superb graphical effects, it is an ingenious way of actually making the sequence playable (especially with only a d-pad). 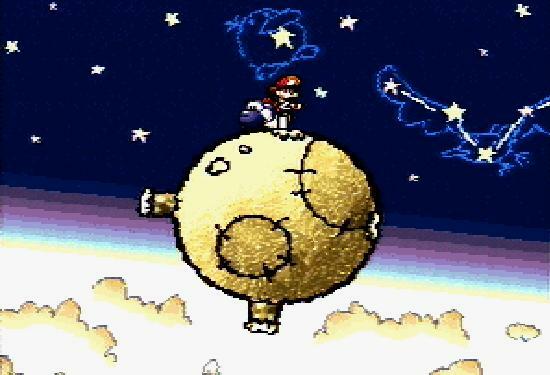 Think about it: if the moon stayed static and Yoshi was forced to run around it, the controls would run into a dead-end once you hit the “bottom” of the moon. Would you continue holding left, thereby reversing the controls for a while as you made your way back up to the topside, or would you have to switch off (from left to right), most likely resulting in a confusing mess? By designing the sequence the way they did, the developers could implement a really creative setting without compromising the tight controls experienced throughout the entire game. I know, I know, I am probably reading way too much into this … but game design really is an art and it is the little things that either make or break a game. Without the perfect combination of graphics, gameplay, and sound a game can easily fall apart. Fortunately, Yoshi’s Island (and especially this boss) excels on all accounts. While this sequence may not seem like much, think back to a bunch of games from the Super Nintendo era and, more specifically, about some of their boss battles. Nothing really standing out, huh? Sure, there were screen-filling enemies and definitely some mildly memorable encounters, but nothing with such a burst of creative energy as any of the boss fights in Yoshi’s Island.